Now let me ask you a question. Are you exhausted all the time, maybe feeling a bit overwhelmed? Are you pissed off? Are you dreading going to work or maybe once you get there, you’re hoping that you can leave soon? Now if so, you’re probably feeling a little bit of burnout and probably a bit stressed out. 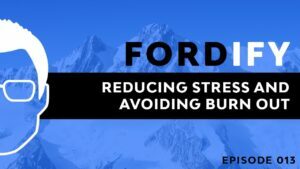 Now burnout can show up in a lot of different ways ranging from being overwhelmed and tired all the time to getting sick regularly. Maybe you’re just feeling like you just can’t get enough sleep. If you don’t take care of these symptoms, they can lead to extremes like full-out anxiety and even panic attacks. Let’s cover the steps you can take to avoid burnout. Do you know why people spend money with you and your business instead of your competition? It comes down to your USP, your Unique Selling Proposition. A USP defines the company’s position in the market place. It’s that distinct, appealing idea that sets you apart from every other “me too” competitor or alternative solution, including an alternative of doing absolutely nothing. 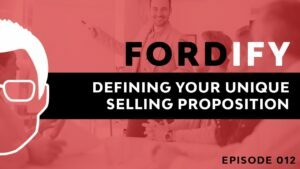 Check out this week’s episode of #Fordify to find out more about defining your USP, or read the post below for more details. What if I told you about an irresistible way that you can use to bribe your prospects into giving you their contact information and growing your list? Well, you can do it and it’s called lead magnets. 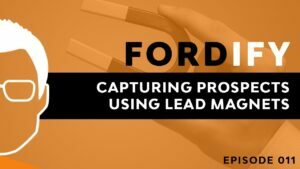 See, capturing leads and growing your lists are the two most critical factors in your business growth. 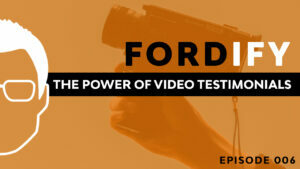 Watch this episode of #Fordify to find out more, or read the blog version below for more details. Do you ever get so busy that it just seems impossible to focus on delivering great customer service? It’s so important in today’s fast-paced information overloaded world that you maximize the customer experience. 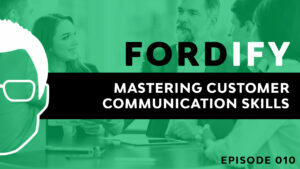 Watch this episode of #Fordify to find out how to master customer communication skills in your business or read below for a written version of the content. What to do before you interview your next employee. Let me ask you a question. Do you have anybody working for you that you wished you’d never hired? Now a quick disclaimer, I recognize that there are two sides to every story, but this episode is intended for business owners and hiring managers. You see, one bad apple can spoil the whole bunch, so if you have one person on your team who’s not performing up to par, they can contaminate everybody. And it all starts with the hiring process. Many employers get hung up on the interview itself. But preparation is really the key. So before you even interview, you need to prepare properly. 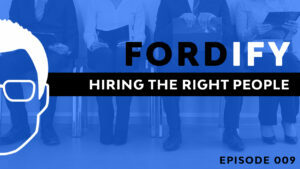 So how do you prepare to hire the right people? Now you may have noticed in a previous episode I did a short segment of this live, but let’s revisit this topic again, because it’s so important. Now, the topic that we’re gonna cover today is simple to understand, but not necessarily easy to implement. There’s three parts, and these parts are like digits in a combination lock. When you get these digits in the right order then the lock opens. But when you get these three things in your marketing in the right order your profits open. So let’s unlock that lock right now for you. Are you sending the right message to the right market, using the right method? 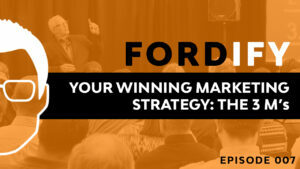 This week on Fordify, Ford is out speaking, so we’ve got a special treat for you. He’s live on stage talking about the 3 M’s: Message, Market, and Method and why they are crucial to your business success. 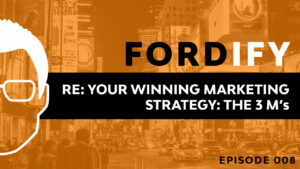 Step 1 is to watch this episode of Fordify. captured testimonials, maybe in print, but there are all different types of testimonials. You know, like your reviews on Google. Those are testimonials. Maybe you’re using Angie’s List or Yelp. Your prospects are bombarded by marketing messages everywhere. Today, there’s so much clutter, making it hard to get through to people. If you have boring copy, it’s even harder to get people to pay attention. Graphics might attract attention, but text sells. 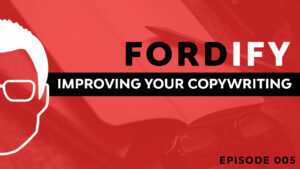 Learn how to write effective copy and format it properly to improve your sales.